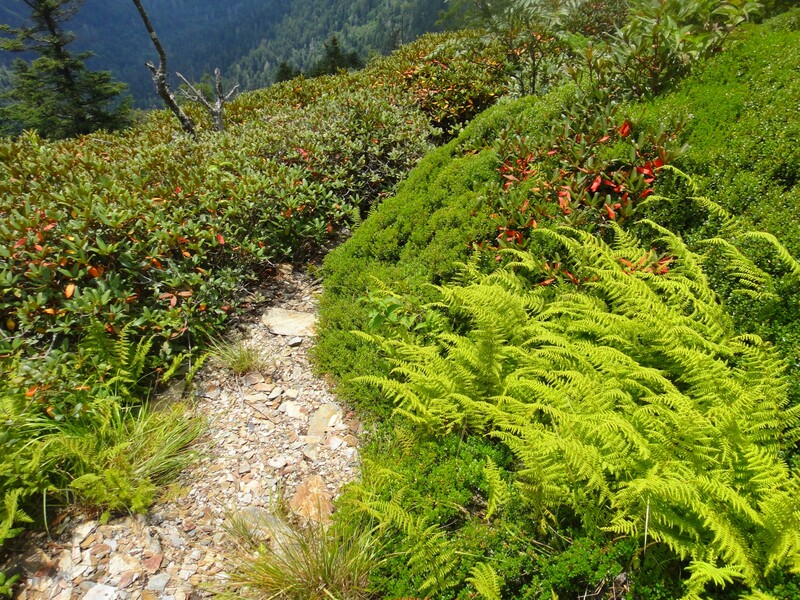 Posted by Jenny in bushwhacking, hiking, history, Life experience. Actually, it’s pretty old… but in this case that’s a good thing, because this is rare and valuable. Everyone who explores off-trail with me knows that I use map, compass, and altimeter and don’t own a GPS. If you are curious about this preference, please read this piece, which I wrote in late 2008. That was toward the end of my long sojourn in New England, so you will find references to oddities like the severe magnetic declination in the Northeast. 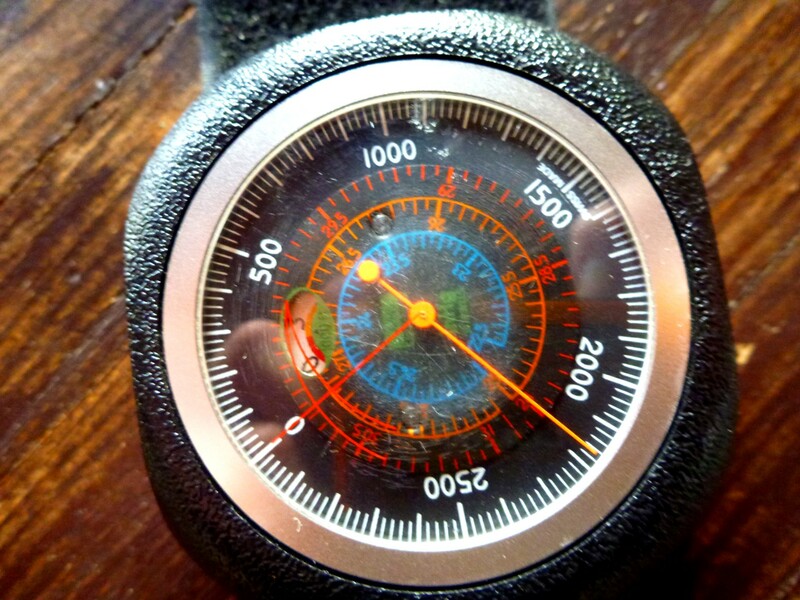 At that time, I still owned an analog altimeter. It was a Peet, the second one I owned. An earlier Thommen had been lost. The Peet got drowned after I returned to the Smokies area and waded up Lester Prong (I’ve also drowned a camera there). And I found that I was unable to replace it, due to the now-complete dominance of digital devices of one sort or another. All I could find on the market was crude altimeters with very large increments of elevation, some meant for skydiving. Because smaller means more precise, you don’t want anything more than 20′ increments. I’d also been using a digital altimeter on a lot of hikes. I do like the multiple functions of these devices, the ability to do things like get your cumulative elevation gain or fun-but-totally-unnecessary things like set an alarm to go off when you’ve reached 4000′. But they have never been as accurate as the mechanical altimeters. So I reluctantly accepted that the older ones were extinct, and I’ve gone through several digital altimeters. They always seem to start going wonky well before the battery dies, and they are severely affected by temperature. Check your wristwatch altimeter in a warm car just before you get out into near-zero temps, then check it again. You’ll see what I mean. In the meantime, GPS technology just keeps getting better and better. I remember folks trying out the early models in the mid-1990s and practically heaving them into the woods with frustration, often for lack of satellite coverage. I don’t hate GPS units or think they’re “cheating” or somehow inferior to traditional technology, though I do believe that everyone who uses a GPS should also know how to use map, compass, and altimeter in case something goes wrong. A compass never goes wrong unless you’re in weird magnetic terrain or unless the compass becomes mechanically broken (that did happen to me with a 25-year-old compass). My only other hesitation about GPS use is that folks sometimes seem to look at the unit more than they observe the terrain. I admire the wonderful tracks and maps that people produce with GPS and associated software. And I see how GPS is especially useful for people pinpointing very specific locations such as old homesites. 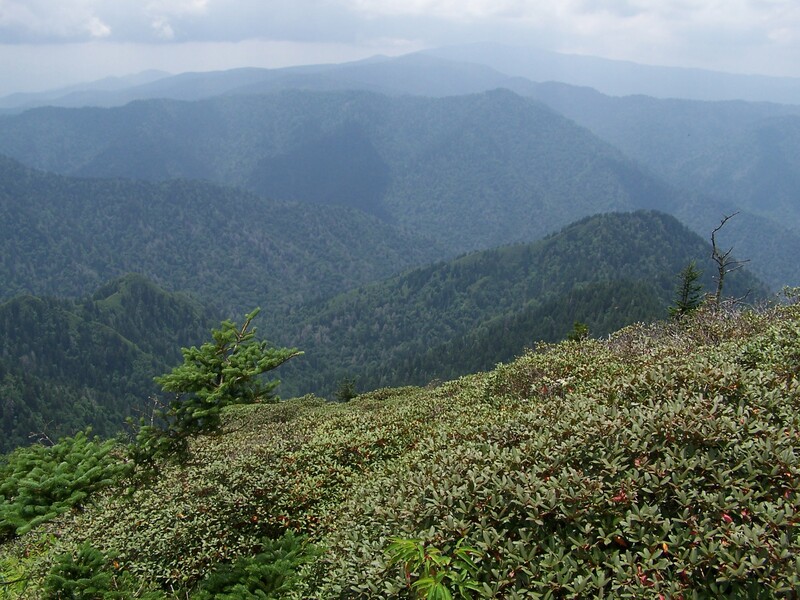 Anyway, there was recently a discussion about all this on the “GoSmokies” forum. I put in my typical comment about my method of navigation: in the Smokies I use altimeter more than compass to locate points like specific stream junctions where I know the elevation. 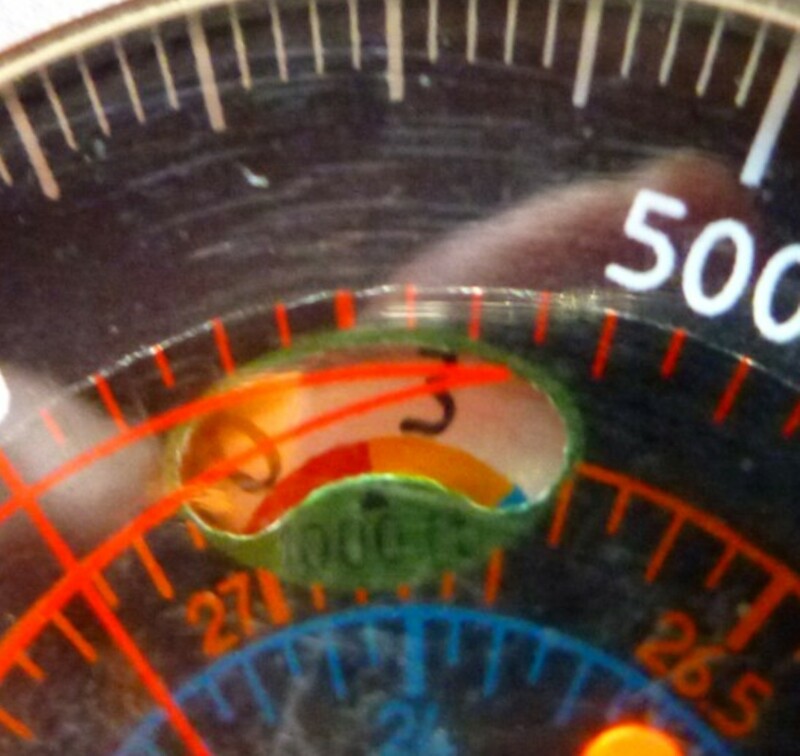 At the end of my comment, I mentioned that if anyone had an old analog altimeter, I’d like to buy it. And someone responded! A very nice guy named Dan G. was willing to part with an old but top-of-the-line Thommen altimeter. I immediately wondered if it had the wonderful feature of my old Thommen: a small window that changes color each time the needle makes a circuit of the 3000′-dial. A little below 3000′, it shows red to alert you that you’re moving up to the next circuit; below 6000′, it shows yellow; below 9000′, it shows blue, and so on. And it DID have the window, plus some features related to units of barometric pressure that my old one didn’t. You may ask what’s so wonderful about a little window that shows color. Well, it’s because the dial can’t show more than 3000′ since any larger amount of elevation would take up too much space. Suppose you could see up to 10,000′ with one revolution of the dial. Can you imagine how small the markings would have to be—or how large the dial would have to be? I know, so much easier to have a rectangular screen with numbers that change digitally. But you miss out on the beauty of a complex and ingenious mechanical device. And…it has no battery. Hah! Closeup of the small window. In the photo above, you see red disappearing to the left and a tiny bit of blue coming up on the right. We are a little more than two-thirds between the 0 and the 3 because the photo was taken at my house, which is at elev. 2160′. You can see that in the top photo. For more photos and another perspective on the outing, go to Dave’s trip report. 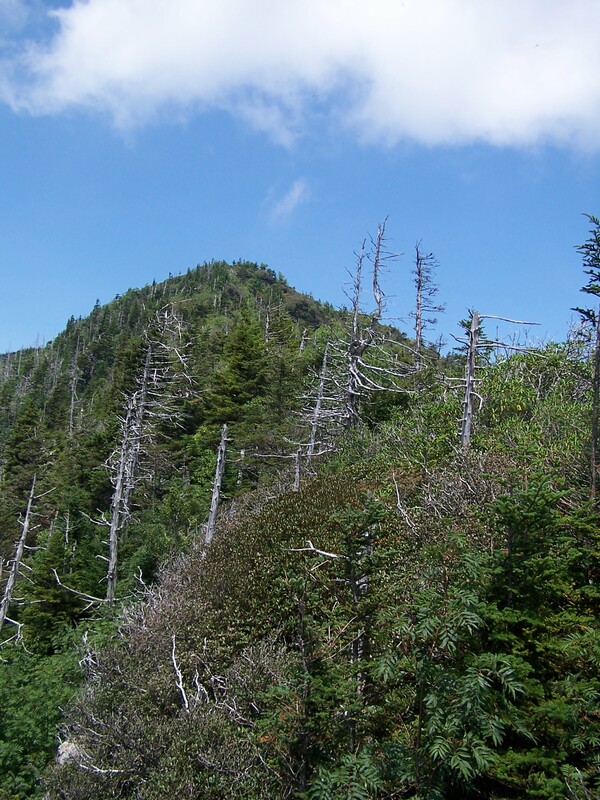 A year ago, the Smoky Mountains Hiking Club set off to climb the left fork of Styx to the top of LeConte but accidentally climbed the right fork instead. Yesterday three of us succeeded in climbing the left fork. It does involve paying close attention at the junction, which is located not by looking at separating watercourses in this complicated, braided stream, but by observing the shape of the valleys. 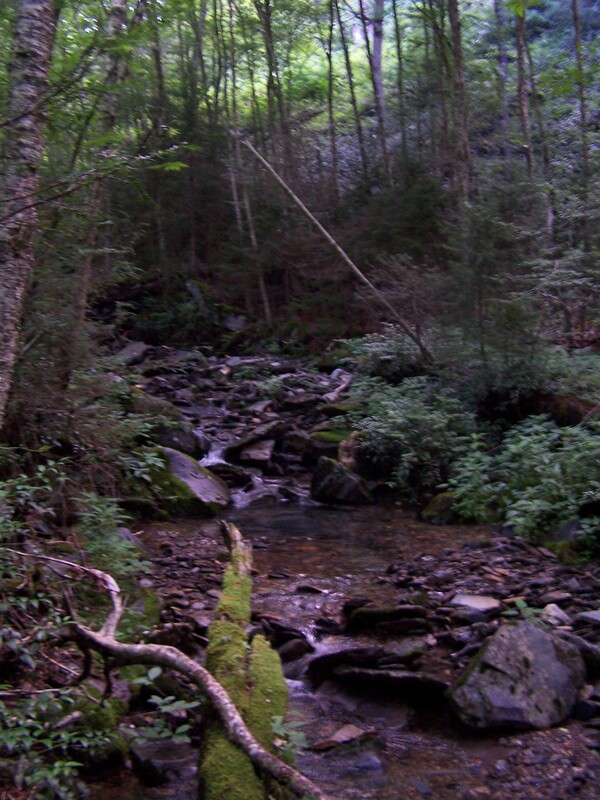 So I returned to the area on the south slopes of LeConte known as Huggins Hell and to the appropriately named stream that runs through it. My companions were Seth O’Shields and Dave Landreth, who proved to have the right combination of determination, strength, and insanity to pursue this quest. 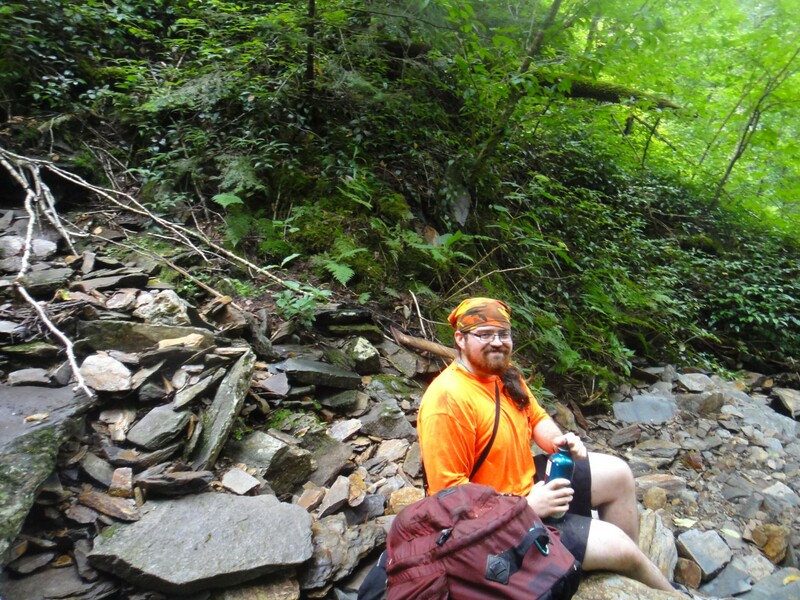 The first time I saw Seth’s orange shirt, I said, “But it’s not hunting season!” However, Seth just likes that shirt, and Dave points out that it makes him easy to spot in the underbrush and also makes him stand out clearly in photos. We relied on my altimeter to identify the elevation (4750′) where we should look for the junction. 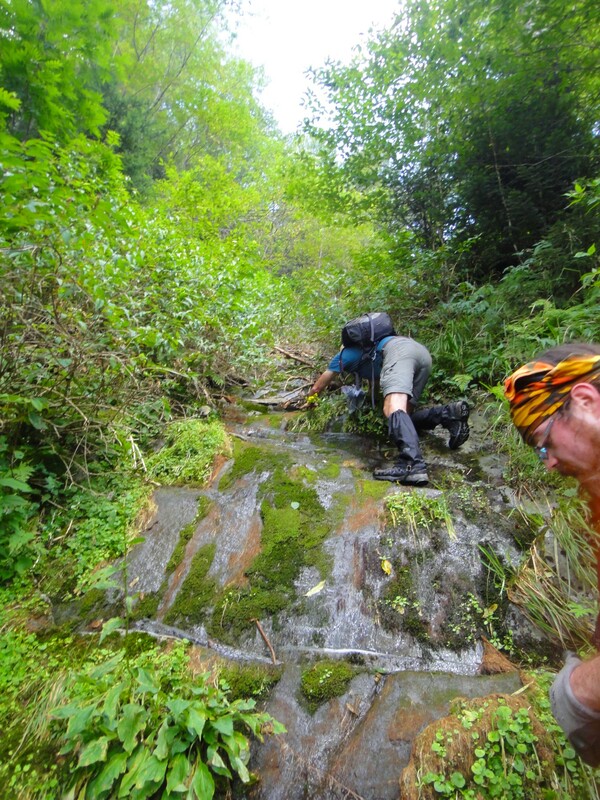 The going in the lower part of the stream was easy, as the streambed held very little water and we were able to rockhop along at good speed. After a brief false move going up a dead-end side draw, we rejoined the main stream and recognized the junction. The lower Left Fork was clogged with rhodo, which made it even more obscure, but we wrestled our way through this section and emerged onto a nifty stone staircase. The rock seemed like a combination of sandstone and Anakeesta—fairly large solid blocks mixed with the sharp-edged slaty pieces that make for great handholds. The rock got slimier as we got higher, making for some tricky spots. 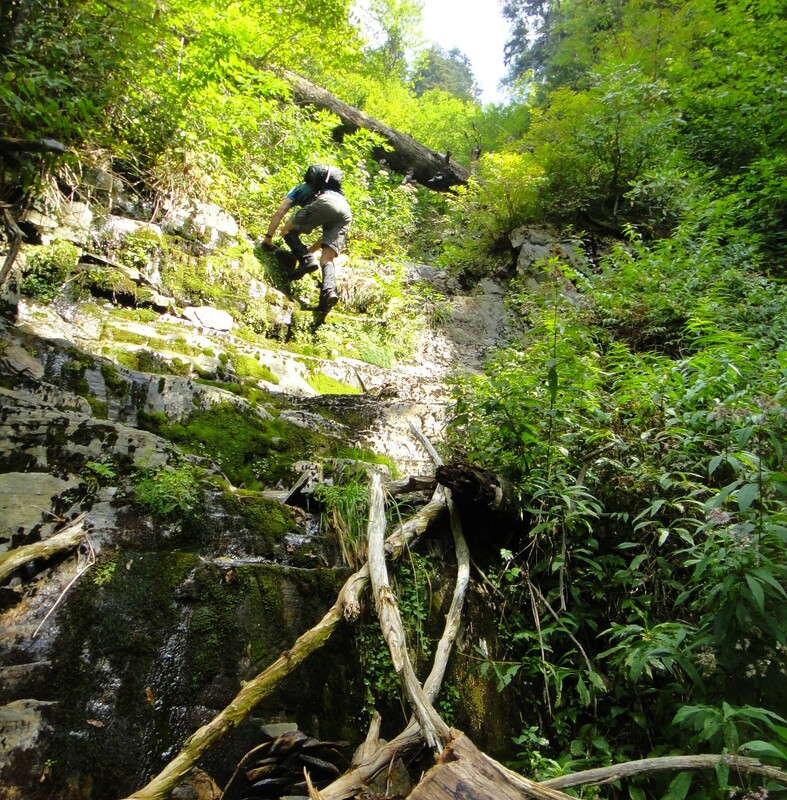 It was a beautiful, wild place, a ribbon of rock and trickling water that led into the steep, mysterious, sometimes dangerous fastnesses below Myrtle Point. 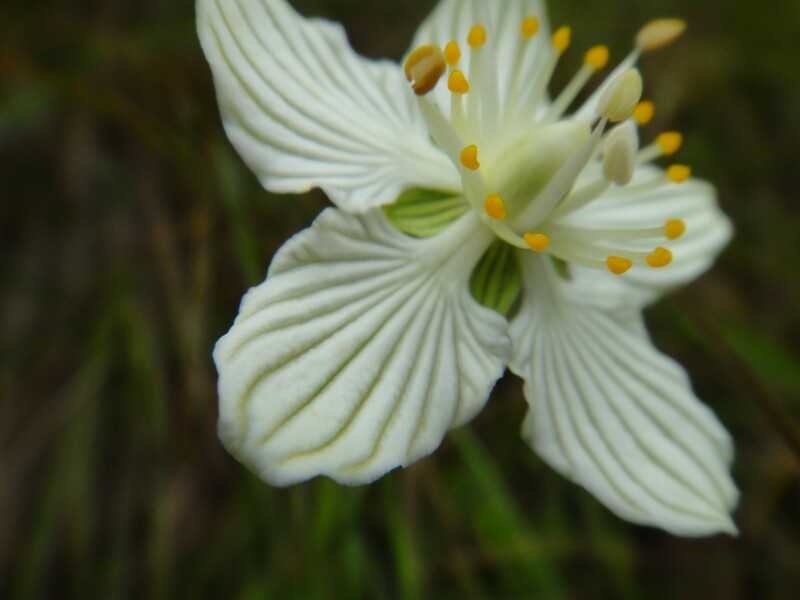 Eventually, around 5800′, the stream disappeared and we found ourselves working through worlds of lush vegetation: wildflowers of all kinds, blackberries, and cushions of deep moss so plush you could kneel comfortably in it and feel yourself sinking in without any discernable bottom. "The crux." Photo by Dave Landreth. 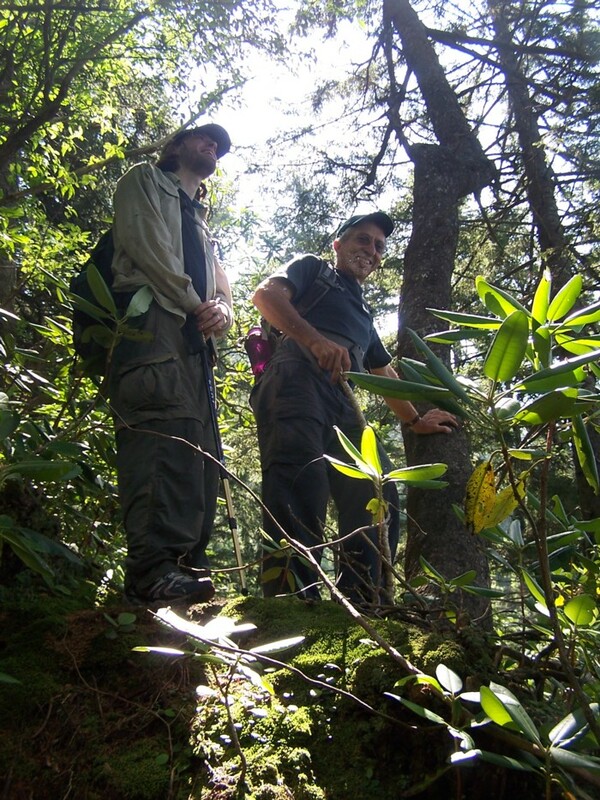 On the far side of the traverse stood a tangled mess of rhodo and laurel, incredibly dense. I fought for a few minutes and got nowhere, but then noticed a little slot through the growth that led to the right. I crawled through it and found myself on a narrow ridgecrest with a view down to the Boulevard. We were just a short distance east of Myrtle Point. We’d expected to encounter a large slide, but it turned out we came up a little to the right of it. 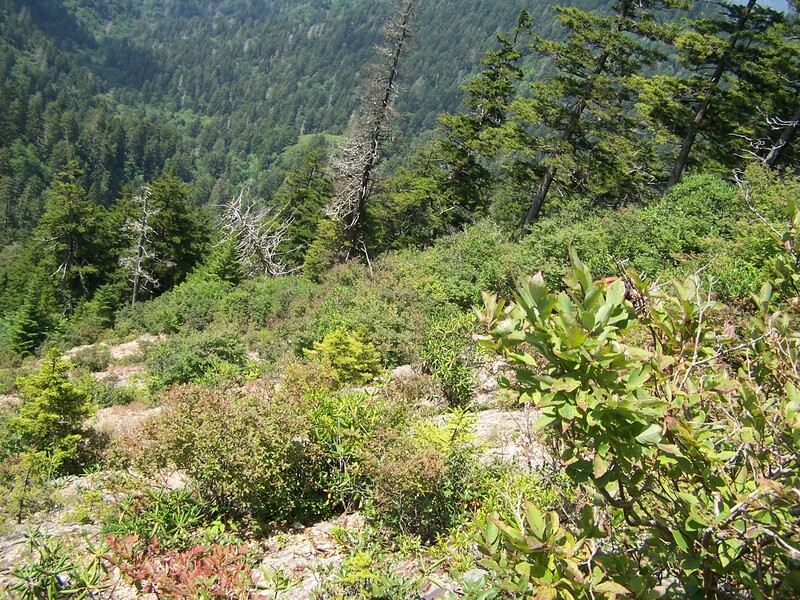 Bears had traveled back and forth on this ridge, making for a decent path where you could almost stand up straight. There was just one point where the bears, probably chuckling to themselves, led the way up a steep outcrop that could only be descended by crawling down a blowdown. Before long we came out on a herd path made by curious humans investigating out from Myrtle Point. 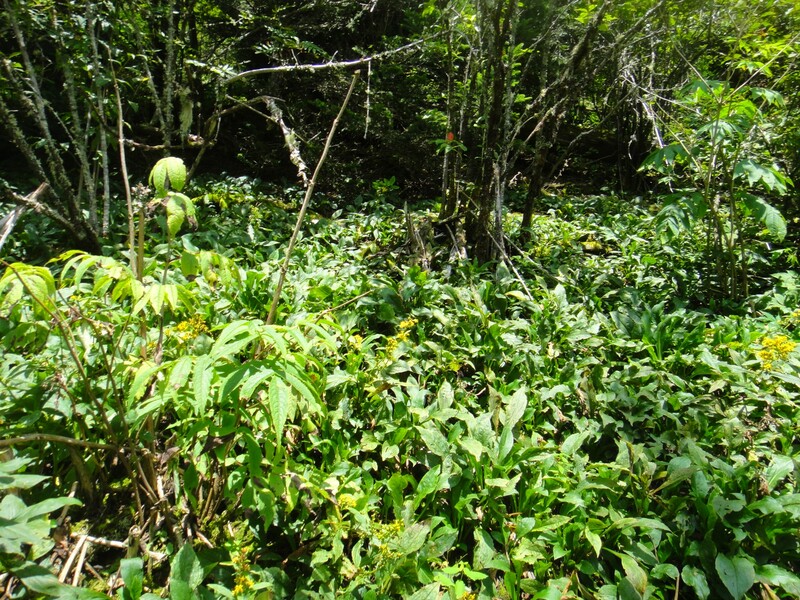 I love the interwoven vegetation there, the mounded cushions of myrtle mixed with ferns and dense masses of wind-sculpted Rhododendron minus with its aromatic leaves. From this understory rise scattered mountain ash and spruce. In the distance, a crazed jumble of jagged green ridges. Two peregrines soared high above as we watched, seemingly playing with each other. We stopped at the lodge and met some of the friends Seth has there—he has frequently stayed there for a few days at a time, doing chores in exchange for room and board. After relaxing for a while, we wended our way down the Alum Cave trail. 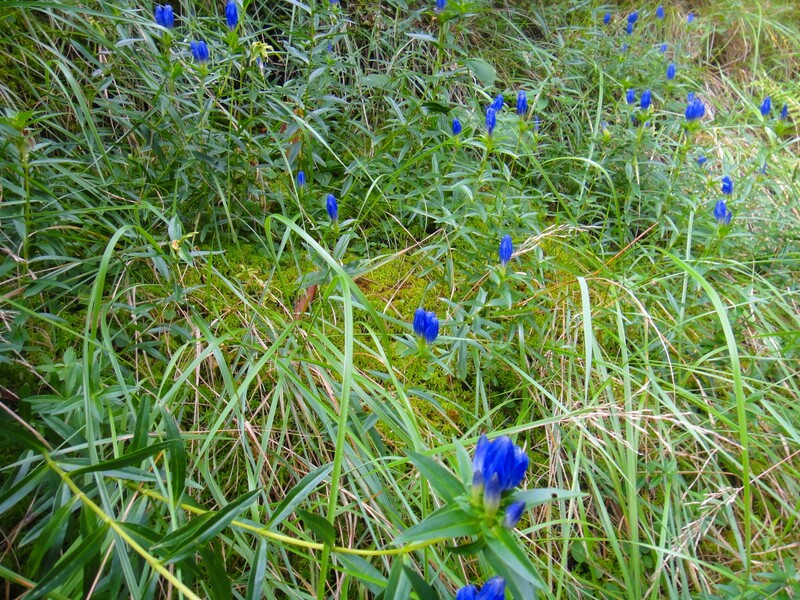 We saw beautiful flowers. This was one of those journeys that touches my imagination in a certain way and makes me long to return quickly to those difficult, hidden, beautiful places. Seven people went on this outing of the Smoky Mountains Hiking Club. 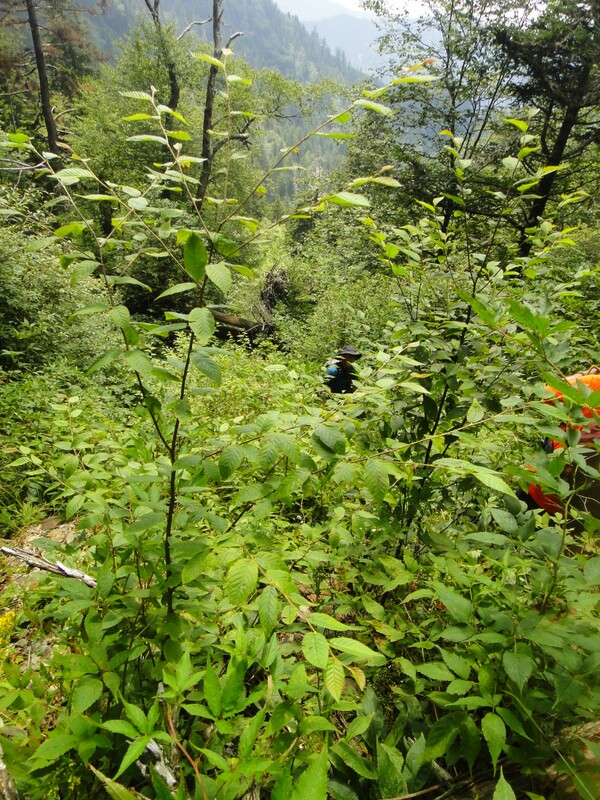 Our goal was to climb the left fork of Styx Branch to Myrtle Point. 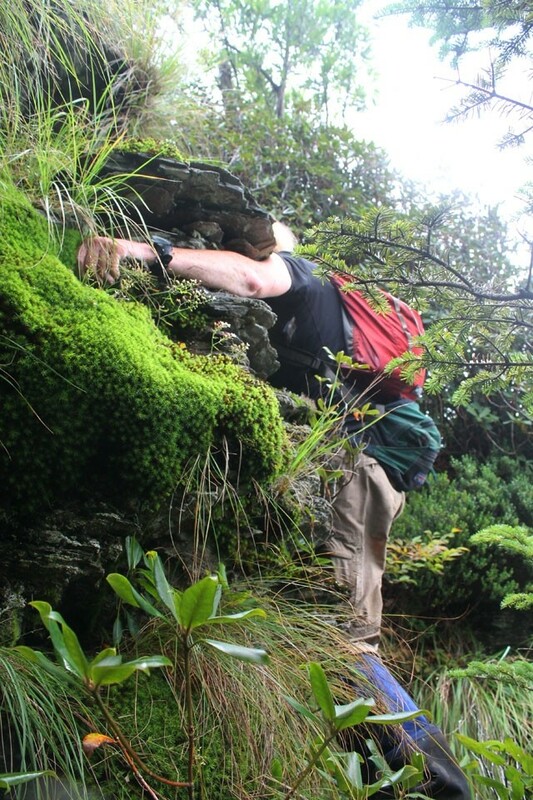 But in fact we climbed the right fork of Styx Branch to a side ridge east of Myrtle Point—even better! Styx Branch is not only a nice little stream, it may also be the only stream in the Smokies that bears a name from Greek mythology. 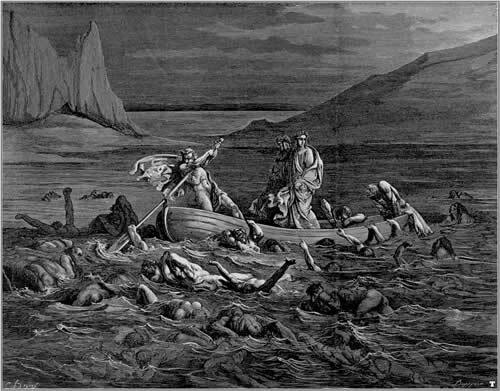 The area through which it flows is known as Huggins Hell, and its name is very appropriately borrowed from the River Styx, by which sinners and evildoers of all stripes enter their new residence for eternity. It joins Alum Cave Creek below Arch Rock. We left the trail for the creek at the bridged crossing just above Arch Rock. The rockhopping was so easy due to the low water levels that it almost felt like cheating. The only real navigational challenge of this outing was to follow the correct fork at the split around 4800 feet. 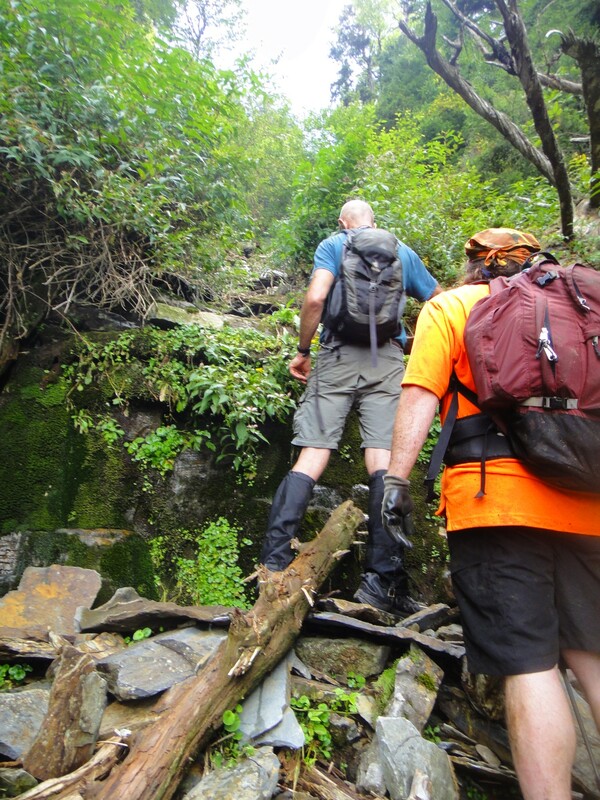 Our leaders, Ed Fleming and Mark Shipley, had scouted the hike in April and found the left fork without any problem. 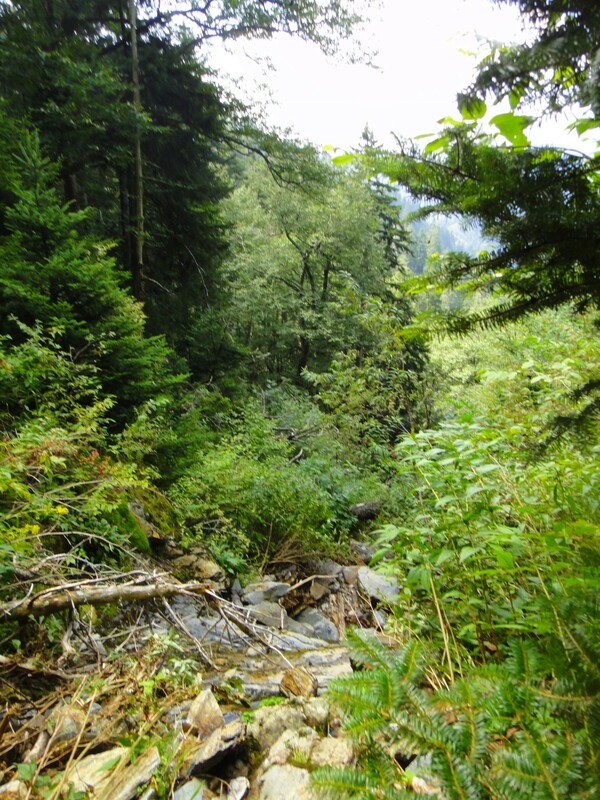 We stopped at the approximate elevation and turned to the left where another small flow of water came in on the right. It must have been a minor side branch. I’ve made that kind of mistake myself. As we continued along, Ed and Mark commented that the way looked unfamiliar—a sandstone cliff ran along the right side, and they didn’t recall having seen that before. Then, when the stream made a distinct turn to the east, we had the proof that we were in the righthand fork. No problem. After a while we got up on a ridge to the right that looked like good going, and on the other side of that we could see an open slide area. We climbed up the slide for a bit. We reached a grassy area above the slide. Eventually we topped out on a ridge that runs parallel to and just south of the Boulevard trail. We could see how far we would need to travel along the ridge to get to Myrtle Point. Eventually we decided to drop down to the trail, which runs very close to the ridge. The way down was steep and rough. Just as we came out on the path, Jim Quick came along. 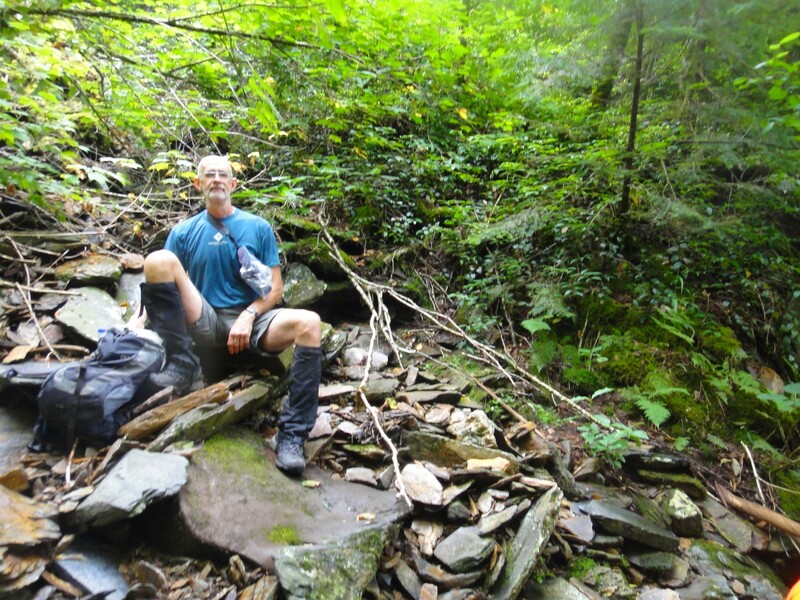 He was the rear leader of another bunch of SMHC hikers who were going up LeConte via the trail. Soon we arrived at Myrtle Point and met the rest of the trail hikers. We relaxed and had lunch. 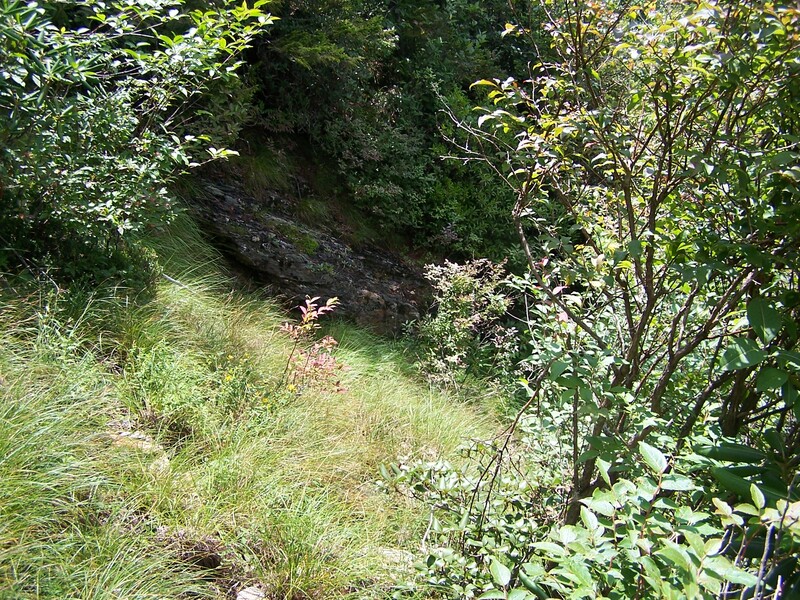 From there we descended by the Alum Cave trail. But my day was not over. I headed over to the Chimneys trail and climbed up to the top to meet some friends who were coming up off-trail from the Chimneys picnic area. Not long after I got to the top of the first chimney, I heard some animated voices coming through the underbrush and caught the sound of a strangely familiar, slightly maniacal laugh. Soon I saw Greg Harrell, Keith Oakes, and Greg Hoover striding purposefully over the rocks to the outer chimney, and then they made their way up to the first chimney. They wolfed down some large meaty sandwiches (I had no appetite whatsoever myself) and got into a discussion about whether there is any point in putting healthy items such as raisin bran into a trail mix. It appeared that there was in fact no point, since Hoover was tossing flakes of raisin bran into the underbrush and gulping down the M&Ms. We enjoyed a beautiful sunset, all soft and hazy in the warm humid air, and the full moon popped over the top of Mt. Mingus and beamed at us radiantly. Mt. 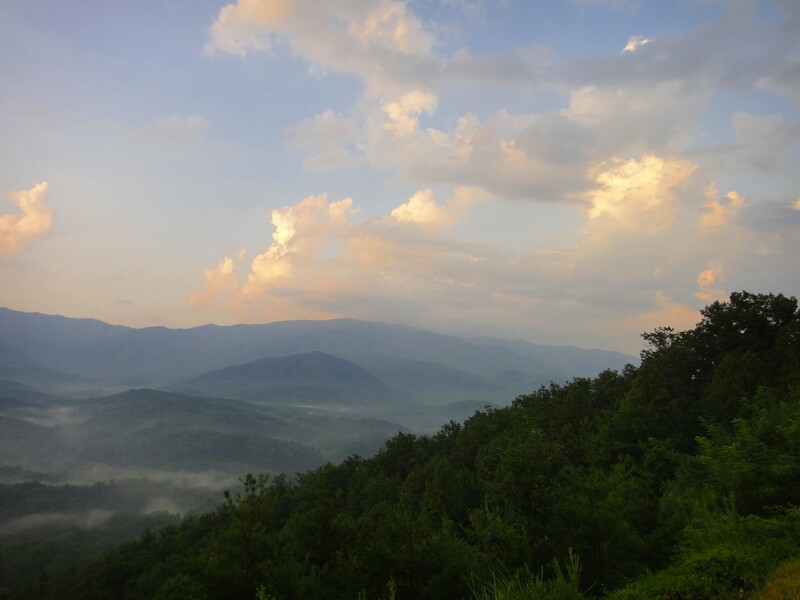 LeConte had a cap of cloud draped just over the very top (just large enough to cause irritation to sunset viewers at the Lodge). Tufts of fleecy cloud floated close to the moon. We explored the “window” below the chimney, and some students of Hoover’s joined us up there for a little while. We stayed until about 9:30 and descended with headlamps. 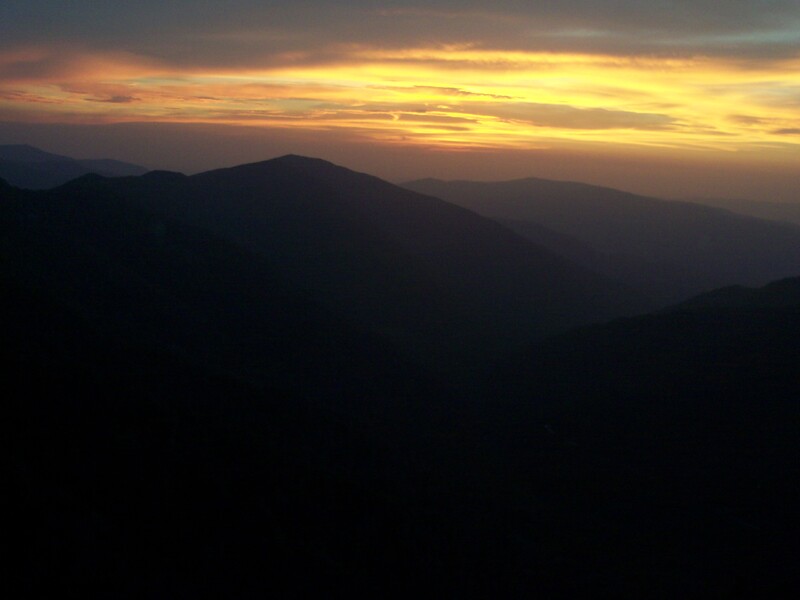 Sunset from Chimney Tops. Photo by Greg Harrell.